Commercial Road Lock is a lock on the Regent's Canal in the London Borough of Tower Hamlets. 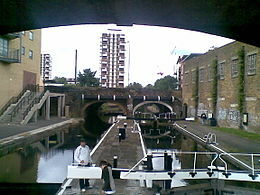 It marks the point at which the canal enters Limehouse Basin, and is the penultimate lock before the canal reaches the Thames. The nearest Docklands Light Railway station is Limehouse. This page was last edited on 30 March 2019, at 14:00 (UTC).